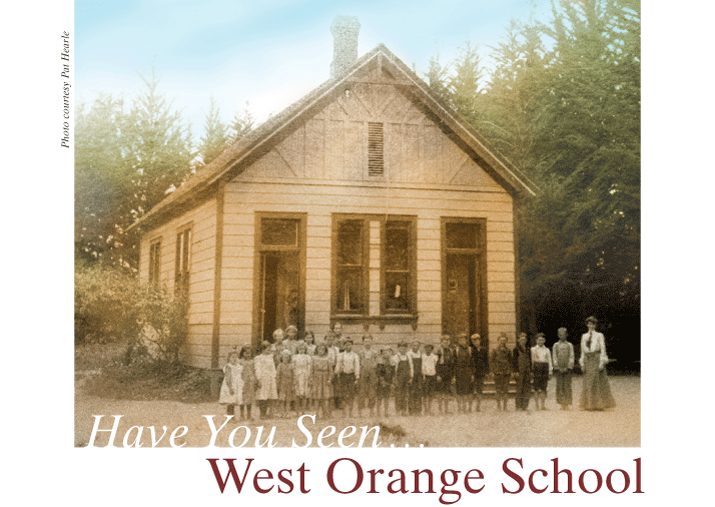 The original West Orange School, circa 1900. Notice the boys posing on one side and the girls on the other. There were separate doors and coat rooms for each, though they all sat together inside the one-room schoolhouse. What is now the City of Orange was once several different communities. One of them was West Orange. West Orange grew up around the Southern Pacific railroad depot, established in 1877 near Flower and La Veta. There was never a store or a post office, but as more and more ranchers moved into the area, they did get their own school, so local children wouldnt have to walk all the way to downtown Orange. The original West Orange School was built in 1890, not far from the depot. It was a one-room schoolhouse, where a single teacher taught all five grades (with the littlest kids sitting in front and the older kids behind, so everyone got to hear every lesson several times over). It operated until 1905, when attendance dropped and the school was closed. In the 1920s, residential neighborhoods began to pop up along the new state highway through West Orange (running east on Chapman to Main Street, where it turned south towards Santa Ana). In 1924, about the time the area started annexing into the City of Orange, a new West Orange Elementary School opened along Almond Avenue, a little east of Bush Street. It was a six-room brick building, built around a central courtyard. Lotta Brandon served as principal (and one of the teachers) from 1924-44. In 1949, a kindergarten building was added on the west side of the brick school. It still stands, and is the oldest classroom building still in use in the Orange Unified School District. As the area began to grow even faster, West Orange School was often on double-session in the 1950s and 60s until a new campus was built in 1965, facing Bush Street. The old brick school was torn down, but a few of the bricks were used to build a planter box outside the office, which still survives. A historical plaque, placed during the U.S. Bicentennial celebration in 1976-77, is located outside the 1949 building. It mistakenly lists 1886 as the date of the original school, but school board minutes and the local papers all prove it was 1890.